Following thousands of telegrams and a letter sent by him to Indian Prime Minister with four demands, the Indian Prime Minister Dr. Manmohan Singh discussed with Mr. Karunanidhi over the phone Monday morning. 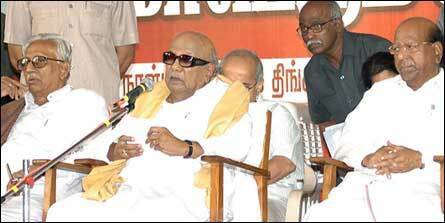 Later, Mr. Karunanidhi addressed the people of Tamil Nadu in a public meeting called on to declare his support to Eezham Tamils in Chennai. Thousands attended the rally. Stating that Dr. Manmohan Singh responded in a sympathetic tone in saying that he had already conveyed the concerns coming from Tamil Nadu to the Sri Lankan High Commission in New Delhi, Kalaignar went on saying that he urged Indian Prime Minister to come forward to the struggle with him if Sri Lanka continued its war against Tamils ignoring the request already conveyed by the Indian Prime Minister to the Sri Lankan High Commissioner. "I am urging the Centre, peacefully and decently, that we would be forced to find an answer to the question whether this [DMK] government is needed if our requests go unheeded. I have to remind that I am foremost a Tamil. I also happen to be the Tamil who is ruling the Tamil Nadu state with the responsibility as a guardian to the people of Tamil Nadu." The above statement was viewed as a veiled threat to the Centre by analysts in Chennai. "It counts the same whether a Tamil gets killed here or in Sri Lanka. This rally is held to express publicly that we urge the Indian government not to give up us [Tamil Nadu Tamils] in our struggle to safeguard them [Tamils in Sri Lanka]." Kalaignar M. Karunanidhi, addressing a massive gathering in at Maangkollai, Mayilai in Chennai, on Monday.